It’s almost the end of flaming June and I had one bread left to bake for Mellow Bakers. I’ve been baking lots of sourdoughs and pizza this month, but there was this one left to have a go at. Jeffrey Hamelman doesn’t specify the beer, so my fellow bakers have produced very different looking breads, it’s been interesting to see what they have come up with. If you want a peek at what they have been doing in the way of beer breads. Click here. So what did I do? I had some roasted barley malt flour from Bakery Bits, so I skipped the part about malting my own barley, which is just as well, as it is really hard to get hold of barley that hasn’t been processed in some way that you can sprout. I can get hold of wheat and rye which are viable, barley for some reason not. What beer? JH says he used a strong south German beer. It didn’t give me enough of a clue, so I went with Guinness, it’s dark, sweet and mild and I thought it might be a good one for this bread. I’ve never used beer as the straight liquid into a final dough before. I’ve made barm bread and stout hot cross buns, both Dan Lepard recipes; in those formulae the beer is introduced at an earlier stage in the process, either as part of a sourdough starter or a poolish, and the breads don’t smell of beer once baked which I much prefer. However, Brian said, “Nothing wrong with this bread!” and ate half the loaf. It looks paradoxically like it should taste really strong and dark, but it didn’t. It was just a crusty yeasted loaf in disguise really. Soft crumb, crusty, mild tasting with a hint of sweetness and malt, no bitterness, but then Guinness isn’t a bitter beer. I made it as a long oval shape, proved in a cloth inside a banneton, and that seemed to work out all right. It had a long final prove, about two hours in all. So a perfectly nice loaf, great colour, split verdict on the smell. Update: the following day the smell of the bread has changed and, well, I don’t really want to use this word, but…. it has mellowed :) not as beery, more of the aroma of the wheat and wholemeal and roast barley coming through – so if you make it, hold off for at least 12 hours before eating it. 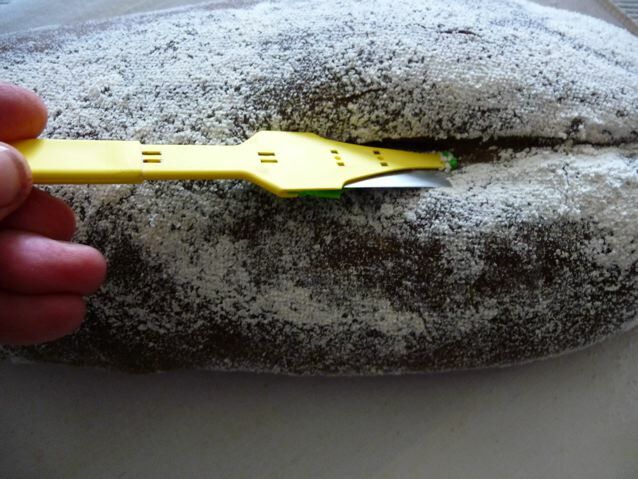 This entry was posted in Bread, Mellow Bakers and tagged Bakery Bits, beer bread, Bread, Jeffrey Hamelman Bread, Mellow Bakers, roasted barley malt on 29/06/2010 by Joanna. I reckon that looks like a winner! 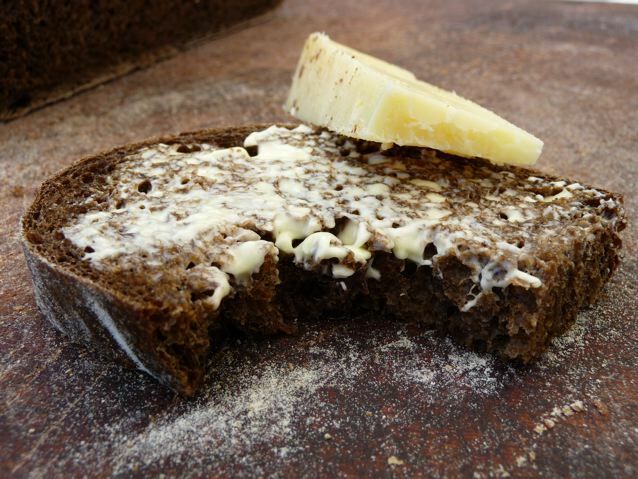 Dark and alluring, the scent of freshly baked bread, softening the butter, just ready to bite…. thats what the first pic tells me and looks like it told Brian that to. You might ‘need a blade’ , and as I have a bit of a collection I’d be the last person to say save your pennies – The ones I use a lot are French and have this nice holder that is good if you are squeamish like me and have a safety cover to boot, so easy to keep track of the knife in the kitchen. Mure & Peyrot. Stocked by Bakery Bits as above in the UK. A good sharp knife will do the job too if you are confident and have a good knife sharpener, or a naked razor blade. I use the holder because I don’t like holding naked razor blades.. but everyone has their own preference. Split verdict on the smell? What does it smell like? 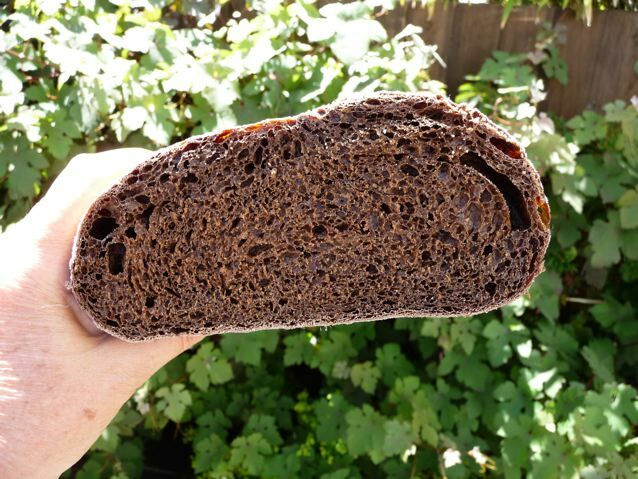 It looks very moreish – reminds me of pumpernickel bread! Brydie, you can order lames from sourdough.com, along with replacement blades. They’re Oz-based – you might enjoy their forum too! BTW, the MB link doesn’t work. I tried from your post there and got “does not exist”. Well, I just finished making the malted barley and roasting it! So much fun! 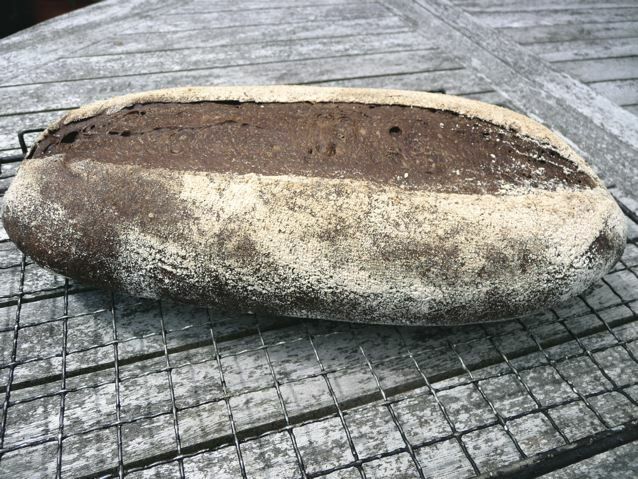 I hope to make mine soon, and hope it will turn out as beautiful as yours – I also made only Lepard’s Barm bread, a huge hit in my home, one of my favorite breads of all times – so I am curious about this one. Unfortunately, I won’t be able to complete it in June, as my time is running out! I’m going to study the July breads later on. Bialys, some big ryes… and something else – can’t remember, Abby…. I’ll have to go and look. In the meantime I’ve made a couple of loaves of an old favourite from my early baking experiences, this gorgeous Dan Lepard soya, oat and linseed loaf which is full of good things and makes a lovely sandwich bread. Sally, I look forward hugely to seeing what you make of this bread and reading about your malting experiments! That Brian is a darn good photographer! His pic of a slice (minus artistic mouthful) of your lovely loaf with the butter and the piece of cheese …… mmm ….. really tantalising! Isn’t it strange how the change in colour modifies our expectations of taste? I would have expected you to say that it had a very different (roasted malt?) taste to it and your description of it being a normal yeasted bread in another colour really surprised me. Bottom line: it looks very more-ish. I’ll tell him! He’ll be chuffed to hear you say that, Blue. The taste got stronger when it got a bit older, some breads are like that…. This looks like a lovely loaf, but you didn’t sound overly impressed? It got better with age. The general consensus is that men seem to prefer it…… gender specific bread, hah! From your description and the comments I’m not sure this is a bread that I’d enjoy the flavour of, but wow, does it look amazing! Such a glorious dark colour. Perhaps I’ll have to make it next time I see my brother and see what he thinks of it! it might have to be renamed ‘manbread’ …..